Professional meteorologist helping users better understand weather events. I love weather, but I also enjoy telling a story using the data that observe weather. As a research meteorologist, I have built, analyzed, and visualized all sorts of atmospheric data. My products, presentations, and peer-reviewed literature have been utilized in multiple sectors of the weather, water, and climate enterprise, including international partners. My services include consulting, outreach, and expert witness in the areas of atmospheric science, climatology, and STEM. 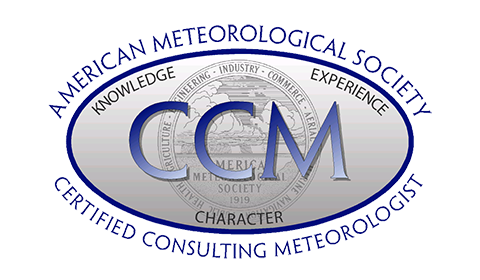 The American Meteorological Society has awarded me the recognition of Certified Consulting Meteorologist (CCM), which recognizes individuals who have excelled in knowledge, experience, and character. Over 700 CCMs have been awarded since the 1950s, and about 250 are currently active. For more information about me, as well as my services, please take a look at the links below. Also feel free to contact me for more information. "The Greatest Risk is Not Taking One"
Learn more about how I became a meteorologist, what projects I have worked on, and how I obtained certification. Look at an example of how I can turn the most up-to-date weather data into a usable product, using GIS technologies. Whether it's communicating environmental data, testifying in a court case, or talking to kids about STEM education, I can help. My services are available 24/7, including weekends. I will tailor my work to your needs, and strive to provide the best result.